The last week has been very busy and pretty tiring…though definitely not regrettably so. We’re finally getting things settled and organized in our new house, and only have one or two more things to do at the old house before we can turn the keys in (and hopefully get some of our security deposit back…). 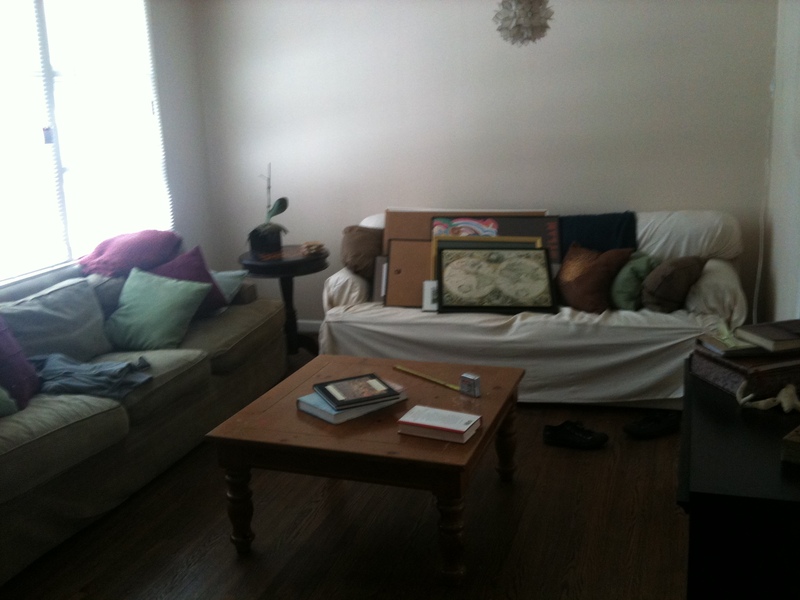 I really hate moving, though I really really wanted to get out of our old house – my allergies were getting worse, and I don’t like being unstable anyway so knowing that a move was looming in the near future but that I couldn’t do anything about it yet was somewhat unsettling. But anyway, we’re mostly just down to unpacking all the books (ALL THE BOOKS) and hanging stuff on the walls now! The house is a 3 bedroom, but we’re using one of them as a dining room and one as a reading room. You will not find any pictures of the reading room here yet, because it’s the most unfinished room as of yet, being home to all of the books that are still in boxes in the garage. We’re also wanting to get a card table (at least, something that size) for that room so that Matt can study chess better, and an easy chair. Plus the litter boxes are in there right now too. But here are some pictures of the rest of the house (minus garage and bedroom). 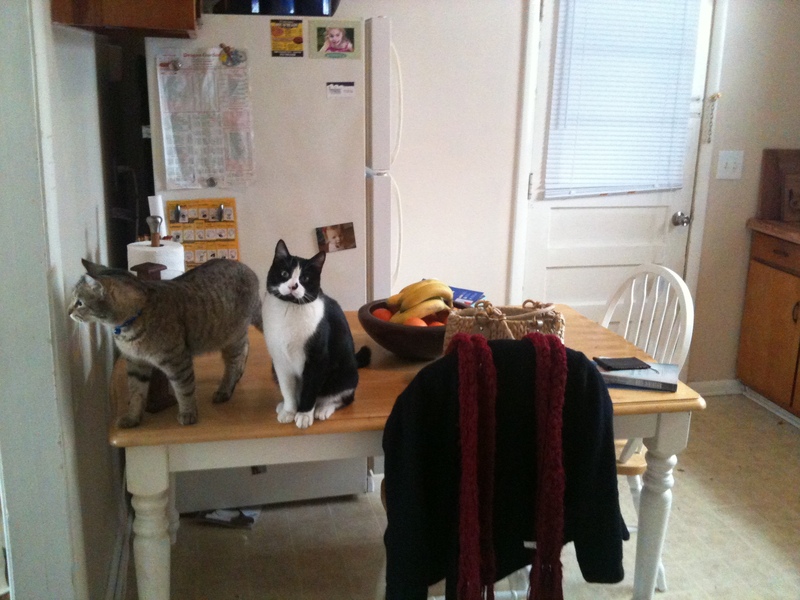 This is the kitchen table and the door to the garage. Along with Bitey and Calliope, who were pretty traumatized by the move but seem to have settled in pretty easily. 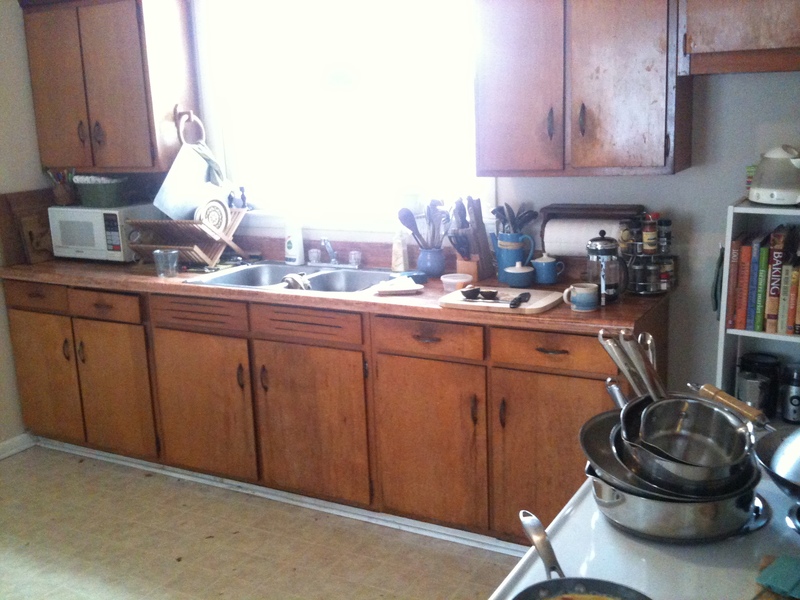 Here’s another angle of the kitchen. You might notice that there are pots and pans on the stove… I’m hoping to get some hooks so that I can hang t hem up under the cabinet above the stove. Will update the blog as soon as I do so (or at least, I’ll try to). 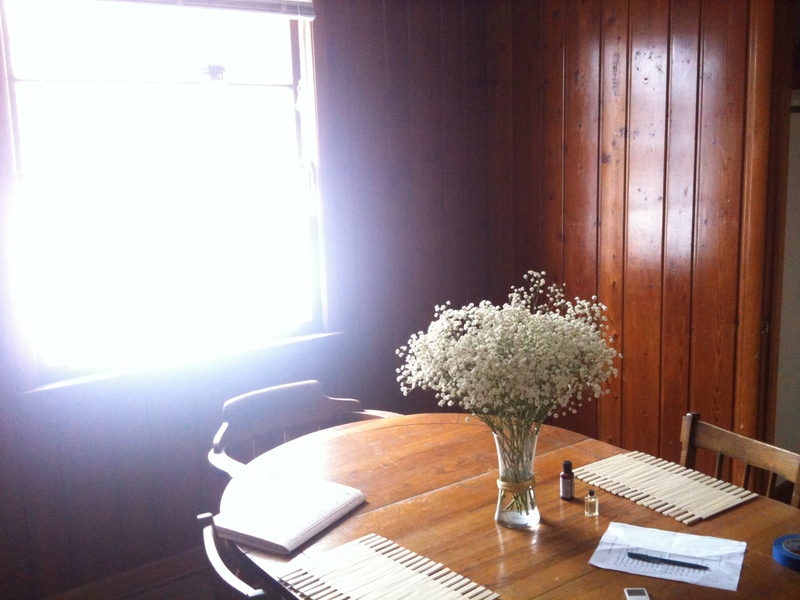 Here is our wood paneled dining room, which is beautiful. We’re also going to look for a side bar/buffet that we can put in here. And we plan to put up maps on the walls (and the globe on the buffet). Here’s the living room. 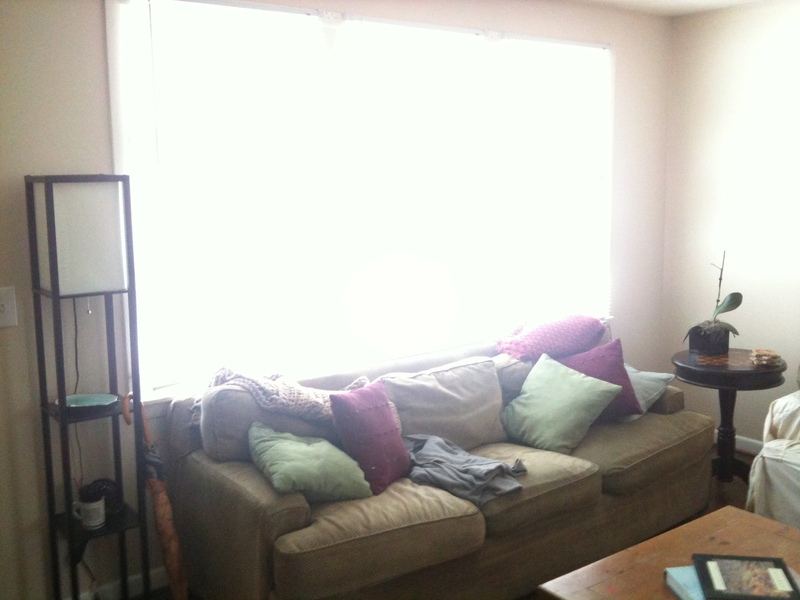 I was standing next to the TV, and the front door is right next to the lamp on the left. So there’s your update. I’d do more but need to get ready for work soon…. We’re going through another period where we only have two managers, and I have to close for the next three days (which is sad because it’s the complete opposite of Matt’s schedule). Sigh…. Oh well, it never lasts forever…! I’m so bad at blogging. I also don’t journal nearly as much as I used to. I kind of think this is a good thing (the journaling, anyway) since it’s because I tend to use Matt as a sounding board instead of a sheet of paper, and my journals have always sort of stood in the place of actual friends. But I do need more practice writing. Also, the blogs are more for friends/family who want to keep up with my life since I’m still pretty terrible at being outgoing and talking on the phone. Anyway. I’ve had the last two days off; I was supposed to work on Monday but we ended up being closed all day due to the snow. I was scheduled off yesterday and today but am going to have to close tonight because of some staffing issues (grrrr). It’s, surprisingly, still snowing too. So we’re going to be slow at work, I can guarantee it. People don’t like to drive in the snow, especially if it’s dark. I can understand; I sure wouldn’t be going out except that I have to work. To change the subject, we’re going to be moving here in the next couple of weeks (FINALLY). We have high hopes of moving into a house a couple of blocks down the road from our current house, but have yet to hear back from the real estate company. It would be another rental, but we’re going to open a new savings account to save for a down payment on a house. We just don’t have enough money right now to buy a house. Matt did just open a credit card account to try to build up his credit, and mine is good but could be better. Eventually we’ll stop renting. But in the meantime, this house we’re hoping to get is brick and kind of an ugly shade of blue (why do people feel that they have to paint over brick?? ), but it’s growing on me. The landscaping needs lots of work. If we get it, I’ll post pictures. I’ll try to blog more for real. I don’t have a ton to say at the moment though….